RIO DE JANEIRO, Jan 12 2015 (IPS) - “We ran down to the beach and found a black tide, whose waves didn’t make the sound of water, but the slurp of a thick paste,” said Alexandre Anderson, describing the oil spill in Guanabara bay in the Brazilian state of Rio de Janeiro which turned him into an activist and leader among the local small-scale fishing community. The January 2000 disaster marked a low point for environmental conditions in the bay, and drew global attention because of the impact of the sudden massive spill of 1.3 million litres of oil from a leaking underground pipeline. The water in the bay is also polluted by untreated sewage from Greater Rio de Janeiro, which has a population of 12 million. Nevertheless, fish and fishing have survived, although the number of local fisherpersons has dropped around 60 percent since then, to 9,000 today, Anderson estimates. The threat to their livelihood comes mainly from the shrinking of the space available for fishing, which covered 78 percent of the bay a few decades ago and currently is limited to just 12 percent, he said. The activities of the oil industry’s plants, pipelines and tankers occupy 46 percent of the bay and that area is expanding, due to deepwater drilling in the Atlantic off the coast of Brazil, and the construction of a second refinery near the bay, set to begin operating in 2016. 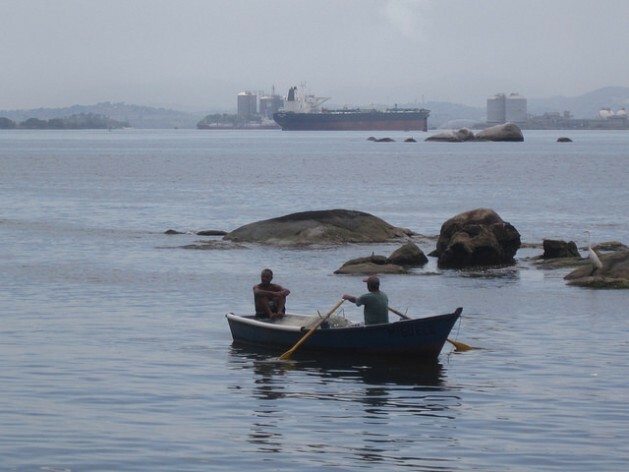 “The oil industry is synonymous with the end: the end of fishing and the end of fish in Guanabara bay,” Anderson told IPS. Besides narrowing the space available for fishing, the numerous pipelines that crisscross the bay change the environment. The oil is piped at high temperatures, to keep it liquid, while the natural gas is pumped cold, at dozens of degrees below zero. Brazil’s state-run oil company, Petrobras, occupies islands in the bay with regasification plants of liquefied natural gas and stocks of oil and gas, supplied by oil and gas pipelines. Marine life in the bay also suffers the effects of the sounds and vibrations caused by the pumping of tons of gas and oil at high pressure. “Imagine the impact of all of that on the seabed,” said Anderson. The small-scale fishing community has fallen victim to the major economic transformation of the Rio de Janeiro metropolitan region. The economy of Rio, best known for its cultural activities, tourism and carnival, is now largely based on oil and the metalworking industry. The oil deposits discovered in what is known as the “pre-salt” area, below a two-kilometre- thick salt layer under rock, sand and deep water some 300 km off the coast of Rio de Janeiro, have fuelled the recovery of shipyards that were practically inactive and have drawn large multinational engineering and oil services corporations to the area. They also boosted the choice of Itaboraí, 60 km from Rio de Janeiro and near the northeast edge of Guanabara bay, for the construction of a petrochemical complex, COMPERJ, limited so far to a refinery with a capacity to handle 165,000 barrels a day. On the other side of the bay, along whose banks the metropolitan region of 12 million people has grown up, Petrobras has been operating the Duque de Caxias refinery, which processes 242,000 barrels a day, since 1961. “With the pre-salt deposits, Brazil will produce between 4.5 and 5.5 million barrels a day over the next 20 years, and will be able to export another two million, becoming a major oil exporter,” said Alexandre Szklo, a professor of energy planning at the Federal University of Rio de Janeiro. Brazil’s share of total global oil supplies might be small, only around five percent, but this country accounts for 60 percent of orders for drilling rigs and oil exploration and drilling systems, because almost all of its reserves are offshore, said Szklo. It’s an opportunity to develop the naval industry and services for that sector, thus benefiting the economy of the state of Rio de Janeiro, off the coasts of which are the main pre-salt deposits, which also extend to other states to the north and south. Brazil hopes to tap into this enormous source of wealth to improve its education and health systems over the coming decades. But some curses are inherent. Because of its diversified production system, by contrast with Saudi Arabia, Russia and Venezuela, Brazil is protected from the main curse, which is sacrificing other sectors of the economy, especially processing industries, for an overvalued local currency and high dependency on oil exports, Szklo said. But there is no denying that Rio de Janeiro suffers locally from Dutch Disease – an economic condition in which a nation’s economy becomes overly dependent on the export of natural resources. “Oil production generates few jobs, but it provides work for highly-paid skilled workers who demand expensive services, driving up local costs, which debilitates other industrial sectors,” the professor explained. On the outskirts of Campos, 280 km northeast of Rio de Janeiro, where large amounts of oil (not pre-salt) have been extracted in deep waters over the past three decades, the phenomenon helped destroy the local sugar industry and drove the cost of living up to the level of wealthy cities. Rio de Janeiro is experiencing the same phenomenon, which has made it one of the most expensive cities in the world. The cost of housing in middle-class neighbourhoods has tripled in the last five years. This explains the royalties charged by municipal and state governments in oil-producing areas, as a way to prepare for the future economic transition, after the oil reserves have been exhausted. But it is the social and environmental curses whose repercussions are felt first and which generate the most resistance. “The choice of location for the installation of COMPERJ was a bad one, between protected natural areas and a national park, threatening rivers that are still in good shape, and the last preserved area in Guanabara bay,” said biologist Breno Herrera. He led a movement supported by local inhabitants, scientists and prosecutors which blocked the plans of Petrobras – the owner of COMPERJ – to turn the Guaxindiba river into a waterway for transporting heavy equipment to the petrochemical complex. “The dredging could stir up heavy metals lying on the riverbed and pollute fish and people,” said Herrera. The refinery will cause acid rain which could destroy forests and green areas in the mountains, towards which the wind blows, carrying pollutants produced by the processing of oil, said Herrera, the former head of a protected natural area jeopardised by the oil industry. The Duque de Caxias refinery, “one of the worst sources of pollution in Guanabara bay, also pollutes the air in nearby neighbourhoods, causing respiratory diseases, allergies and red, itchy eyes,” said Sebastião Raulino, an activist with the Forum of People Affected by the Oil and Petrochemical Industry (FAPP).